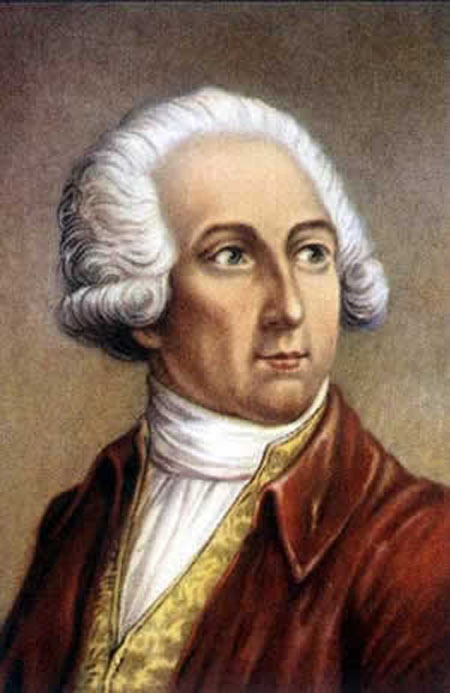 Born in Paris on August 26, 1743, Antoine Lavoisier enjoyed the support of a wealthy extended family. Educated to become a lawyer, Lavoisier also used his time at the College Mazarin to attend science lectures. He quickly decided that he would rather pursue a career in chemistry. Lavoisier felt that science should serve society and to that end he helped design better street lighting, water hydrants, and sewer systems. In 1766 his essay on how to generate light for a big town earned him first place in a contest sponsored by the Academy of Sciences. In 1775 he was appointed to the post of director of the gunpowder administration and set about improving the production of gunpowder and practices within the industry. During this time Lavoisier decided to supplement his income by joining a group of government tax collectors. He joined the tax administration in 1768 and soon after, in 1771, he met and married Marie Paulze, the daughter of another tax collector. Lavoisier made several key discoveries concerning chemical compounds, oxygen, and combustion. In 1774 he experimented with oxygen and recognized that air was not an element but a mixture of gases. Lavoisier also defined combustion as a combination of a burnable material with oxygen. This conclusion overturned the common assumption that all burnable material contains “phlogiston,” which escapes as fire, leaving only ash behind. Lavoisier became dissatisfied with this explanation when his careful weighing proved that some ashes weighed more than the original samples he burned. He published his theory on combustion in 1783. Related to his work with oxygen, Lavoisier determined that water was composed of hydrogen and oxygen. Marie Lavoisier helped her husband in countless ways. She translated scientific articles and correspondence from Latin and English, which Antoine did not speak, kept lab records, illustrated his writings, and assisted in laboratory work. Perhaps his most innovative experimentation resulted in his theory of conservation of mass. It is said that Marie encouraged him to think about the gases that escape during reactions and capture them, procedures which enabled Lavoisier to quantitatively measure the products of chemical reactions. This work led him to conclude that, while matter may change its form during chemical reactions, it may not be created or destroyed—that is, it is conserved. Lavoisier produced two major works that gave chemistry its modern form: Nomenclature, published by Lavoisier and a group of other scientists in 1787, described a concise system of naming chemical compounds; his Elementary Treatise of Chemistry, published in 1789, summarized his new discoveries and view of chemistry, including his conclusions on the conservation of mass. Rising tensions during the French Revolution (1787­1789) eventually led to Lavoisier’s death. As resentment grew against the government, tax collectors were singled out. Although he had never abused the position, Lavoisier was sentenced to die by guillotine in 1794. Antoine Lavoisier offered generations of scientists new ways of thinking about and investigating the chemical foundations of the physical world. Although Lavoisier was very involved in the scientific community of his time, his discoveries and ideas were not all immediately accepted by his peers. His practical applications were most valued during the time he was living. For instance, Lavoisier’s improvements in gunpowder proved critical to the success of the American Revolution. His challenge to the phlogiston theory was controversial, contributing to intense debate about fire and flammability. Lavoisier’s experimental method supported his findings that phlogiston was a myth and that oxygen was necessary for combustion. His Elementary Treatise on Chemistry promoted his revolutionary ideas and spread them quickly during his lifetime and after. Marie helped to ensure the legacy of their work. Following his death, Marie Lavoisier compiled his research and expanded his unfinished papers into an eight­volume work, Memoirs of Chemistry, which she published under her husband’s name in 1803, nine years after he died. It included an explanation of his Law of Conservation of Mass. The chemical names and terms that Lavoisier created are still used today. This system allows compounds to be described in a uniform manner, enabling researchers everywhere to communicate clearly. Finally, Lavoisier’s Law of Conservation of Mass became a foundation of chemistry and all physical sciences. In the twentieth century, it was amended to describe the conservation of matter and energy. ALBERT EINSTEIN used this law as part of his famous formula, E = mc2 (energy equals mass times the speed of light squared). Scientists are still exploring the implications of that finding.